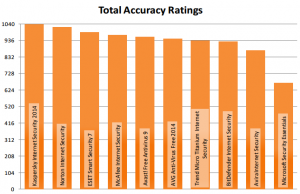 Kaspersky Antivirus is a well known and popular antivirus program for full PC protection. Here is a chance to get 6 months / 180 days free subscription of this antivirus program (100% legal license) for protection from virus, worms, backdoor, Trojan. 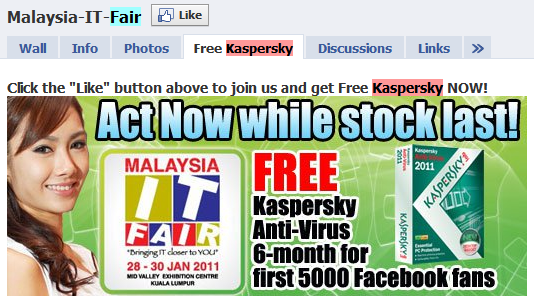 As per the promotion of this antivirus, Kaspersky company is promoting this software thru Malaysian IT Fair Facebook page from where you can download the free subscription licensed copy. Offer is available for first 5,000 fans and till now the number has reached to 2,800 only. So still there is a chance for 2,200 more fans to get the free subscription. But as the facebook fan page for IT fair is secured only for Malaysian people, you can’t just go and access the page. If you are living outside Malaysian, then you will have to follow the below steps to get the free subscription copy of Kaspersky Antivirus 2011 for 6 months. Once you setup the proxy server, you can access the Malaysia IT Fair Facebook page. You just need to “Like” that page to get the 6 months license for this antivirus program. You also need to enter your name, email etc. before submitting the form available on that page to get the license in your inbox. Once you will complete that process, you will get the 6 months ( 180 days ) free subscription of Kaspersky Antivirus 2011 to use on your computer for full virus, worms, backdoor, Trojan protection.